It retains Land Rover’s legendary off-road ability - yet not at the expense of ability on road. Land Rover introduced the original Freelander in 1997 and it quickly established itself as the market leader in the compact SUV class. Replaced in 2007 with this Freelander 2 the second iteration was only ever offered in five-door guise. Like its predecessor though it retains Land Rover’s legendary off-road ability - yet not at the expense of ability on road. There are petrol versions for foreign markets but you’ll only ever find a 2.2-litre turbodiesel under its bonnet here. Land Rover’s mighty off-road ability and prestigious, upmarket status mixed in with a fine-driving, good-looking and urbane off-roader makes for an appealing all-round vehicle. It’s hardly surprising then that the Freelander 2 has been such a success. Only one body style is offered, the five-door model making up the entire range. Similarly there’s only one engine worth considering in Ireland, that being the 2.2-litre four-cylinder turbodiesel. It delivers punchy performance and respectable economy - even if the Freelander’s fuel consumption and emissions aren’t quite as good as rivals from Honda, BMW and Toyota. 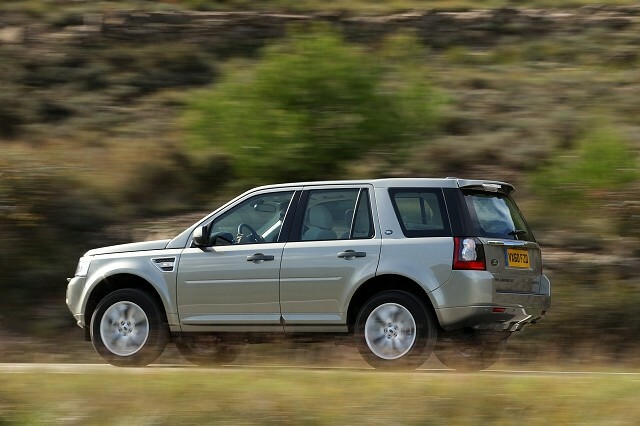 The firm introduced a two-wheel drive version badged TDe to improve economy, but the savings are marginal, and you do lose some of the Freelander’s impressive off-road ability as a result. Space is good inside and the boot is a decent size. The interior feels solidly built and the Freelander delivers a surprisingly agile drive on the road. Trim levels start with S, rising through GS, XE and HSE - the latter being near Range Rover in its opulence. S covers the bases though, with GS and XE adding climate control over standard air conditioning and benefitting from cruise control, too. An automatic is offered optionally, but the standard transmission is a six-speed manual. A 2.2 TD4 4x4 in XE specification is a great all-rounder, but those not needing the Freelander’s off-road ability might want to choose a front-wheel drive version instead. Either will give decent performance and a feeling of indestructability, the Freelander proving to be a useful, spacious and comfortable family car. Sadly it won’t be as reliable as Nissan, Toyota or Honda alternatives. Land Rover’s reliability record is improving of late, but still not up to the standards of the Japanese firms. The Land Rover Freelander 2 is a tremendously capable car whether you’re using it around town or crossing country as the crow flies. Prestigious, spacious and comfortable there’s a great deal to admire. Only sketchy reliability and expense count against it when compared to rivals like Toyota’s RAV4, Honda’s CRV and the Nissan X-Trail.